The Formula One 2018 season was pretty good, wasn’t it? After a season-long battle between Lewis Hamilton and Sebastian Vettel, it was the former who came out on top, taking his fifth world championship. But last year was certainly the closest season we’ve seen in a while, and that bodes well for 2019. With new front wing regulations intended to make close racing easier, and the likes of Charles LeClerc and Pierre Gasly now in likely competitive cars – not to mention Max Verstappen and Vettel still in the mix – 2019 could be an even better season than last year. And as we get closer to the first race, teams are now testing their 2019 challengers. Below you'll find pictures of every new car. You can find out to watch them pre-season testing here. Mercedes has given its W10 a fresh look, with the traditional silver, turquoise and black now being joined by a mesh of three-pointed stars towards the rear of the engine cover. This year, the team from Brackley has also painted the Halo of the car silver, so it looks more integrated than before. It’s time to put aside those fears of ugly-looking 2019 cars. The driver line-up stays the same as 2018, so it’s Lewis Hamilton and Valtteri Bottas. Ferrari has revealed the new SF90, and unless the rules throw up something strange – which they can do – either a Mercedes, Red Bull or Ferrari will win the championship next year. This year Ferrari keeps runner-up Vettel put pairs him with Charles LeClerc, one of the most exciting F1 talents in recent times. The car looks like an evolution of last year’s but with Red Bull amounts rake, and it’s bound to be fast. We’ll find out when pre-season testing begins next week. 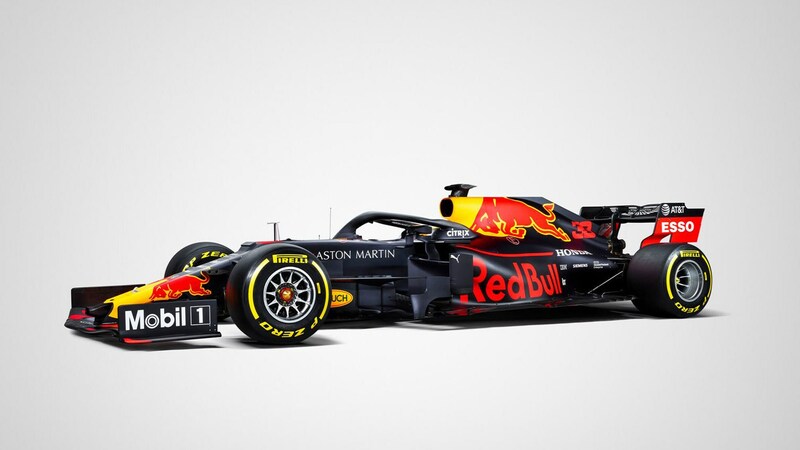 The new Red Bull is equally new, with a fetching dark blue and red livery – though we’re told it’ll be gone by the time takes to the track for the first race. In fact, it's already gone now that testing has started, and you can see the more traditonal RB15 livery at the top of this article. This year Max Verstappen will race alongside Pierre Gasly, who is promoted from Toro Rosso after Daniel Ricciardo’s moved to Renault. But the biggest change for 2019? Out goes Renault power, and in comes Honda. Toro Rosso has revealed its new Honda-powered challenger, and it’s further proof the new regulations haven’t ruined the look of this year’s cars. As far as drivers go, this year, the team gives up Pierre Gasly to its Red Bull stablemate, but gets Alexander Albon and Daniil Kvyat instead. GP2 hopeful Albon was pinched from Nissan’s Formula E team earlier in the year, and we all know who Daniil Kvyat is. Renault has an all-new driver line up. Alongside perennial overachiever, Nico Hulkenberg, Renault has also lured Daniel Ricciardo from the Red Bull Program – a strong move as it looks to become one of the top works teams. Renault is launched the R.S.19 in Enstone. Force India is back, but not as we know it. The new line-up includes Lance Stroll – whose dad bought the team last year – as well as a more experienced Checo Perez, and in 2019 the RP-19 should have the stable investment to build on last year’s interrupted but impressive performance. Williams has revealed the livery for its new 2019 car. Martini is out and ROKiT – a new Telco company – is in, but the Grove team are sticking with a Mercedes power plant. Driver-wise, returning veteran Robert Kubica is teaming up with GP2 star George Russell, who also worked with the Mercedes F1 team last year. This is the all-new McLaren MCL34, unveiled today at the team’s Technology Centre in Woking. Like last year, it’ll feature a Renault engine after a few unpleasant years with Honda, and the team will also start with an all-new driver line-up as well. Carlos Sainz Jr and Lando Norris replace Stoffel Vandoorne and Fernando Alonso. The Ferrari-powered-but-Alfa-Romeo Racing-badged Sauber team is currently last on the launch schedule, and revealed its car on the morning of the first winter test in Barcelona. This year sees the return of 2007 world champion Kimi Raikkonen – Sauber is where he first started in F1 – and alongside him, Anthony Giovinazzi. Key dates: when is 2019 winter testing?